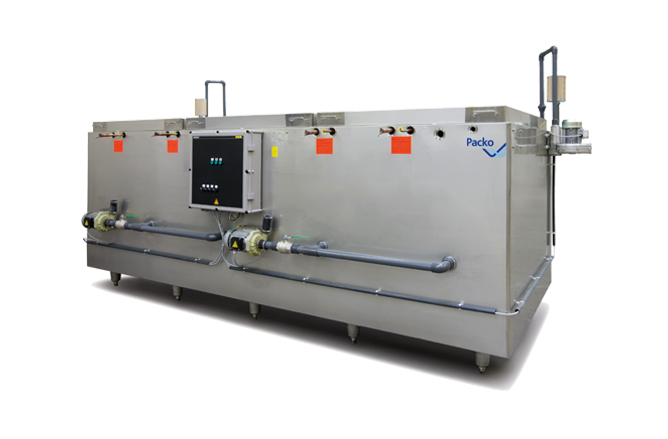 The Packo Ice Builder is the result of many years of experience in cooling liquids for the dairy and food industry. The PIB is the heart of the DIB system, it builds up an ice reserve with which it can make a large amount of ice water at zero degrees. The PIB is constructed of thick stainless steel plates (AISI 304) for a long lifetime. Environmental friendly PU-foam is injected between the interior and exterior housing for insulation. The insulation has a thickness of 50 mm to ensure a completely vapour-tight construction. This prevents thermal losses and improves low energy consumption. The standard PIB is supplied with a powerful pump that transports the ice waterthrough the heat exchanger in the DIB tank. A rapid cooling, without the risk of freezing, of your valuable milk is ensured. Bacteria don’t stand a chance! Possible options include an extra ice water pump for instant cooling and a time clock for the use of cheaper night-rate electricity. The unit can be easily integrated into an existing cooling system, or can be offered as part of a completely new system. • This solution is perfect for farms where access to water for pre-cooling is a problem. i.e. it is possible to cool all the milk without any bore water. Click on the images below to check out some of our PIB installations around the country.